Do you go coco-nutty for coconut oil? There’s a good reason coconut oil has had such popularity these days. As a nourishing fat and nutrient-dense food, more people are looking for ways to include coconut oil in their diet. I’ve already talked about 31 of my favorite uses for Coconut Oil, but today I want to share 9 delicious recipes that use this amazing super food. Whether you are looking to satisfy your sweet tooth or looking for a crunchy snack, there’s a recipe below that will blow your mind. Trust me. This delicious recipe from Butter Believer isn’t just delicious, it’s a wonderful metabolic boosting recipe! (Learn why your metabolism matters here.) Click here for the Coconut Oil Chocolate recipe. Um… anyone else start drooling from the name of this one? Big thanks to the Coconut Mama for this recipe. Click here for the Flourless Chocolate Coconut Butter Cake recipe. You’re welcome. (Another killer recipe from the Coconut Mama. What would you expect with a blog name like that?) Click here for the Homemade Nutella recipe. One more from the Mama of Coconuts… but I can’t wait to make these for my little ones. Quality fats for the win! Click here for the Coconut Butter Buttons recipe. Grain-free and oh-so-yummy. Recipe from Peace, Love, and Low Carb. Click here for the Chocolate Covered Cheesecake Bites recipe. Okay, so this one doesn’t actually have coconut oil in it… but I had to include it because how often do you find a killer recipe that calls for coconut milk? Wouldn’t it be awesome to know how to make your own? I thought so. Click here for the Easiest Coconut Milk Recipe. Seeing how most store bought mayos are full of GMO’s, PUFAs, and garbage vegetable oils it’s nice to know you can make your own nourishing mayo easily. 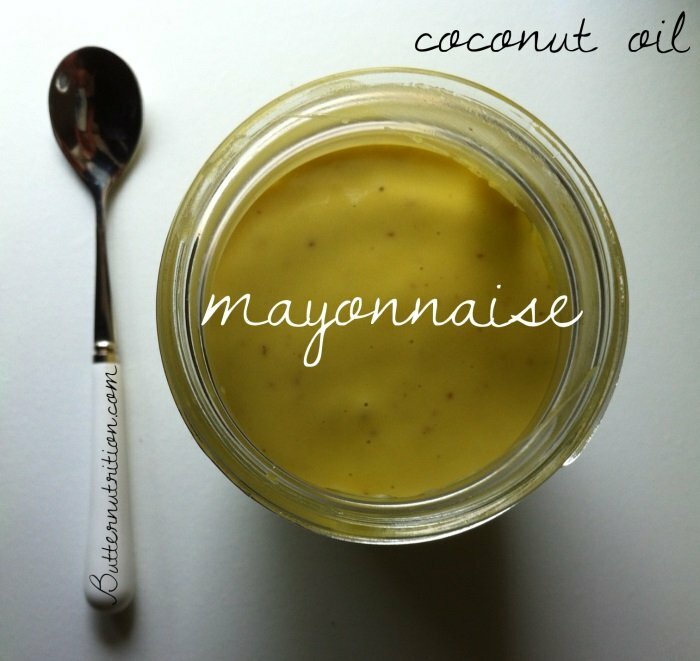 Click here for the Coconut Oil Mayonnaise recipe from Butter Nutrition. Say “hello” to your new best friend: Delicious potato chips made with nourishing coconut oil from the Nourished Life. Yum! Click here for the Homemade Potato Chips recipe. One of my own personal favorite recipes. These crunchy guys are perfect to snack on or use as a vehicle for your favorite salsas or dip. Yay for coconut oil. Click here for the Sprouted Tortilla Chip recipe. Tell me: What’s your favorite way to eat coconut oil?